Dewalt Heavy-Duty 18V Cordless Reciprocating Saw Kit. 1" stroke length and 2,900 spm for fast cutting. Keyless blade clamp allows quick blade change without touching blade or reciprocating shaft. Electric brake minimizes risk of blade breakage when exiting plunge cuts. Compact and lightweight; 7.1 lbs. Pivoting shoe with open top for maximum visibility. Blade can be reversed for flush and plunge cutting. Variable speed with trigger lock for increased blade control. Charges all DEWALT® 7.2V - 18V batteries (except Univolt batteries) so users need only one charger for multiple cordless products. Charges the battery in 1 hour or less thus minimizing down time. 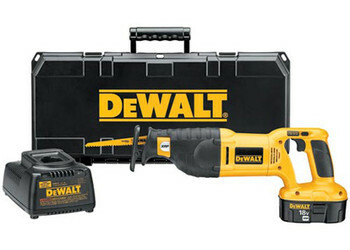 The DEWALT 3-stage charging system provides maximum run-time and extends overall life of the battery. Battery thermal protection system prevents charging batteries that are too hot or too cold which would cause damage to the battery and a loss of run-time. Diagnostics with LED indicator are 5 indicators to communicate battery charge status: charged, charging, power line problem, replace pack, and battery too hot or too cold. High capacity XRP™ battery has 40% more run-time than standard batteries. Powers entire DEWALT® line of 18V tools allowing users to run multiple tools off of the same battery pack.